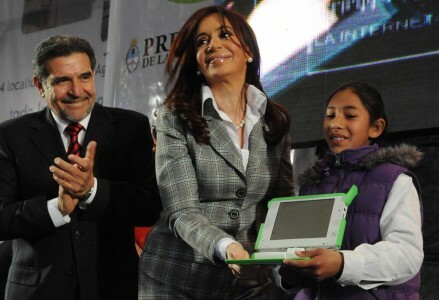 This week, Argentina’s president Cristina Kirchner oversaw the launch of the La Rioja deployment and the handout of XOs to roughly 2,000 students. This was the public start to the 60,000-student deployment announced this spring, named the Joaquín V. González program after the distinguished politician and educator. The program will provide an XO to every primary school student and teacher in the province by next year. Sabrina Díaz Rato reported on the event, with shout-outs to Claudia Urrea and Martin Langhoff, who are currently in Argentina helping the learning and technical teams of the project get off to a good start. But the most interesting part of the article comes at the end, where she summarizes related efforts by Walter Flores, Argentina’s Education, Science and Technology minister. Flores sees La Rioja’s program becoming a model for an implementation that is interesting to other regions, and mentions some specific neighboring provinces looking for advice – the Argentine provinces of Catamarca, Corrientes, and Mendoza, Chile‘s Atacama region, and the Bolivian municipality of Yacuiba. De acuerdo con un comunicado de la cartera educativa, Flores destacó las repercusiones que está generando este modelo educativo y aseguró: “Los riojanos, en este aspecto, estamos haciendo punta porque nuestra provincia está dotada de un modelo que hoy resulta interesante para otra jurisdicción” y agregó que “la región de Atacama en Chile, y otras provincias argentinas como Catamarca, Corrientes, y Mendoza están solicitando asesoramiento”. And he described in detail a “very positive” meeting with Brú Cavero, the mayor of Yacuiba. Yacuiba is the capital of Gran Chaco province, one of the few provinces to declare federated autonomy last year. Cavero wants to become the first municipality in Bolivia to implement OLPC, and has been discussing the idea with La Rioja and Flores since the Spring. El ministro Flores mantuvo reuniones el 19 de julio con autoridades municipales y educativas del municipio boliviano de Yacuiba… con el objetivo de exhibir y resaltar las ventajas del programa. Según informaron medios locales, tanto el gobernador riojano Beder Herrera como Flores “comprometieron un equipo técnico encargado de capacitar e implementar el programa para que llegue a Yacuiba, sin ningún costo. Esto es para realizar la socialización del proyecto. Queremos que Yacuiba sea el primer municipio en Bolivia en desarrollar el proyecto”, aseguró el alcalde de Yacuiba, Brú Cavero. In Cavero’s words, “this exchange of experiences among peoples is fundamental to revolutionize education.” I can’t wait to see what that looks like for Bolivia. he mayor of Yacuiba. Yacuiba is the capital of Gran Chaco province, one of the few provinces to declare federated autonomy last year. Cavero wants to become the first municipality in Bolivia to implement OLPC, and has been discussing the idea with La Rioja and Flores since the Spring. CAN u fluent it more ?? Thank you, Hassan. Pablo, I would love to hear more about your project – feel free to write me privately, or to share your ideas (and related requests, advice or lessons learned!) on the OLPC wiki. I wish Argentina Success with the deployments. Great summary of information , SJ. Thanks! We are anxiously tracking OLPC developments down here in Argentina. Long term success of the program is certain, but political conditions are such that any move and initiative by government or opposition is resisted by the other faction sooooo fiercely that it amounts to a threat to the ultimate objective of the move. Well, what else is new, right? Anyway, keep up the good work. I am an EDUpreneur who would at some convenient point like to tell you about my own little project … Have a great day!